Is Greenland close to a climate tipping point? Recent findings suggest climate change in Greenland may be approaching a tipping point, beyond which amplifying feedbacks could lead (probably over centuries) to complete melting of the ice sheet, raising sea level by about 7 meters. In June, a team of glaciologists led by Jason Box predicted that we would see melting across 100% of the ice sheet’s surface area in summer within a decade. They drew that conclusion from data on the Greenland ice sheet’s surface reflectivity, or “albedo”, showing the surface has gotten darker over the last 12 years. A darker surface absorbs more heat, leading to more melting, causing albedo to decrease further, and so on in a vicious circle. “This was so extraordinary that at first I questioned the result: was this real or was it due to a data error?” said Son Nghiem of NASA’s Jet Propulsion Laboratory. The melting has been confirmed by independent measurements, and attributed to a warm air mass sitting over Greenland during that week. Ice cores show this to be a 1-in-150-year event. According to recent modeling, the tipping point for eventual total melting of the Greenland ice sheet could be a global temperature of around 1.6°C above preindustrial. Worse, the lower end of the range of possibilities is only 0.8°C, equal to today’s global temperature. There is broader evidence that no significant cushion remains between today’s climate and a dangerous level of warming. In the last interglacial age 125,000 years ago, called the Eemian, global temperature was only ~1°C warmer than preindustrial (ie. only a couple of tenths of a degree warmer than today). Yet the poles were several degrees warmer, there was no summer sea ice in the Arctic, and multiple studies using different methodologies say sea level was 6-9 meters higher (meaning at least partial melting of the Greenland and/or West Antarctic ice sheets). All this reinforces the conclusion that humanity urgently needs to cut CO2 emissions to zero or near-zero to return the Earth to energy balance, before global warming spirals out of our control. Which other planet is this that you are talking about? So you have not updated yourself with the latest scientific theories? At gochascientific.com, I am waiting for approval. There is a whole universe and do you really believe we will not venture into space? CERN will help, don’t you think so, in just one hundred years we have progressed to a high level of technology, so it is realistic to say we will live in space one day. The Earth is safe as melting ice on Greenland has hardly affected us, I doubt even the polar bears suffer as there is so much land for them. Humans are also important. What is all the money spent on CERN and space technology going to achieve? I feel your data is too shallow. The polar bears don’t have nearly enough land nor ice to live on. Haven’t you been paying attention to the news? It’s even been reported in Time magazine. Haven’t you been taking notice of which news? That the Times is the only news source, owned by Murdoch. Catch up with that news about corruption first and have you also paid any attention to what climate sceptics are saying? You are too biased! There is also MSN and ScienceNews. I have paid attention to what the skeptics have said. A lot of it is gets parroted. Just to get it straight: it’s NO other planet his talking about. OK how much space does a polar bear need? And where did the leaves come from that are said to be below the ice. And we don’t need to worry about climate change because we have centuries left and plenty of time to get into space. Climate change hypocrites. I too would like to know which planet you are referring to (the next one we will be living on). Venus is the closest in size, but is too hot for our own machinery to last on. Mars is closer to the climate of Earth, but it’s too small and has no water to speak of. Mercury is too close to the Sun. The other planets are too far away, too cold, and too huge (weight) for us to live on. We haven’t even travelled past our solar system and no one has figured out how to bend the fabric of space. Your outlook is too narrow. Ask NASA and CERN for details as the public worldwide has paid huge sums for scientific research that will eventually get us off the planet. I have my own research to do in the future. Are you saying I will discover nothing? And how many more scientists with their high qualifications, and geniuses – do they not exist? We have advanced incredibly in the last century so in the next one we have more hope. Your outlook is very short-term. We may be off the planet by the time it melts! What is NASA and CERN for? Looking at data, which is also from over a short period of time, it appears flawed. Greenpeace is also flawed, as I pointed out before. It’s all for the money – read Dr Richard Wellings blog about the environmentalism on eufreshstart.org. That’s news, tell the Times perhaps? I wasn’t saying that NASA and CERN can’t and won’t get us off the planet. I was saying that there aren’t any planets or satellites for us to live on that we can actually get to and that would be able to support human life. You can find the information about the planets on NASA’s website, Astronomy magazines and textbooks, and professional astronomers. My outlook may be a little narrow, but we haven’t even left our own solar system yet. You will probably find something online that will prove your point just as well as I can find something that proves mine. I suppose the same (greed) could be said about the ones who do not believe Global Warming exists. Liquidisedlemonsblog, I believe we are all aware of the cycles of the Sun. What you’re not understanding is that the Earth is heating up more than it ever has in recorded history (and still warming), which is a reason to be concerned. Are you aware what kind of star our sun is? It is a G-type main-sequence star (a.k.a. a yellow dwarf). You should actually be more specific in this question, but that’s how I assume you wanted it to be answered. It boils down to the theories they are using, which calculations and which theory did the scientisits use? eg: The Big Bang theory – unproved but accepted nevertheless! Also, if the ‘facts’ in favour of climate change are so strong, why is there still raging argument about it? There’s still raging argument over the Big Bang Theory. Admittedly, the arguments against usually come from the religious spectrum. You are correct, though, that the scientific community and the government accept the Big Bang Theory. Many theories are argued about. There is evidence from every news source that climates do change. Most of the time it’s in certain areas. It was just on the Weather Channel, yesterday, that entire islands (in recent recorded history) have disappeared as a result of hurricanes. Public schools also teach that the Sahara Desert is growing. There is climate change, but it’s the change on a global scale that has everyone arguing. Truly frightening…and Figure 2 above is more than a little ominous. The only thing we can do is to control ourself and pray. We can not fix the Earth. The problem is too complex. The global warming spirals is already out of our control. The Earth is already destroyed by us (humankind). Thanks for writing this article, it shows that you care about the Earth. Regards. How? I did not realise we had control over vulcanism and wild fires. Of course by the time you posted this crap Greenland is back to its normal state. You global warming alarmists give the rest of us folks something to laugh out loud about. Unless you live on a low island or in a coastal region. Then it’s not that laughable. Climate change is normal and nothing man can do can change that. Lol. Thanks for the voice of reason J. I swear there really is whole new scare philosophy every decade. People just hop from one right to the next. And they always scold us and tell us that we’ll learn the seriousness of it all one day. You know, the old scare tactics were cheaper. Like back in the eighties when we had used up all the trees so we had to use plastic bags. Geez, these days you have to buy a whole new car!! And a crappy, ugly little gutless one too. What is the reason for the decreasing of the albedo? What are the deposits that make it darker, where do they come from? These are the issues raised by those glaciologists’ findings. Before we know the source of these deposits there are no recommendations to be given. And for the uninformed: CO2 is transparent and it does not deposit on top of an ice sheet. I am not claiming CO2 is depositing on top of the ice sheet. I’m saying warmer temperatures decrease the ice albedo by changing the shape of the snowflakes; lower albedo increases melting; and increased melting leads to lower albedo in a positive feedback cycle. I’m also not saying this year’s extreme melting is certainly and totally due to global warming. Of course it is possible that other factors could be contributing, but such a dramatic event is a very large cause for concern. The article does support the conclusion. The worrying news from Greenland suggests we may already be getting close to a dangerous level of global warming. Because of the time lags in the climate system, the only way to quickly halt global warming is to return the Earth to energy balance. This means atmospheric CO2 has to stop rising and start falling, which in turn means humanity must cut CO2 emissions rapidly to near-zero so absorptions by carbon sinks exceed emissions by human activity. Again, where is the evidence, that snow flakes are different this year and that precipitation overal is of the same amount. It all builds up to a confounding of factors. These global warmites don’t need real, tangible evidence. They just shove their data through a computer model and massage the computer model until it tells the right story. Don’t go looking for proper scientific method from these people, they wouldn’t know it if it jumped up and bit them where it hurts. I do not question the evidence. If the glaciologists report a lower albedo, then I trust they got the data right. The question is what causes the decrease of the albedo. For a reminder: China puts another coal fueld power station into operation every month. No exhaust filters whatever are installed. Soot gets into the atmosphere in quantities and is transported over extremly far distances. Wherever it deposits, it wil decrease the albedo. This is why I was mentioning deposits. Currently there is a tendency to attribute any environmental changes to “global warming”. It is simplistic thinking. It may divert attention from real environmental threats and prevent taking appropriate action. Very scary indeed! The facts are there but we carry on like there’s care in world. I don’t know when we are going to take these matters more seriously.We think by recycling some bottles and plastic bags we can save the world. Governments and citizens have to work together just to prevent more ‘tipping points’. When I read this on the GOOD site I was shocked.. real eyeopener.. Thanks for sharing with us all !!! Well, this sounds disturbing. It is in 8 years. If the results are indeed so shocking why isn’t there an open discussion. If the climate changes so radically, shouldn’t the global citizenship be prepared? I am not an environmental scientist but maybe someone could write a brief scenario of what we could expect if Greenland starts melting every summer. Just to clarify, Greenland’s land ice would take centuries to melt, gradually raising sea level by 7 metres. It is Arctic Ocean sea ice that some scientists think may become ice-free in summer by the 2020s. This will not directly affect sea level because sea ice is already floating and displacing water, but it will dramatically decrease the albedo of the Arctic Ocean, accelerating warming at high northern latitudes. I’m not much into science, but this posting caught my eye on Fresh Pressed (congrats on that by the way). I read an article just yesterday disputing these findings by NASA. Don’t confuse global warmites with pesky little things like facts. They get in the way of their religious beliefs. These strange cultists never stop to ask themselves why Greenland got its name nor do they consider for even a moment that it got its name long before the combustion engine saw the light of day. Tom, do you actually have anything of value to add, or are you just a bomb thrower? Also, you *might* want to learn a bit of political history, as to WHY Greenland was named as such. It had little to do with its verdant beauty. It’s long been known why the island got its name: apparently, you missed that class. Climate Change activists sound more ridiculous by the day. eg: the deadly methane gases that will be released by rotting leaves exposed by the melting ice. Absolute rubbish and I question the validity of the facts used in that study. Can we trust certain scientists anymore? How much do they get paid and by whom? A greedy scam. And how much space does a polar bear need? We can fit 62 million humans on a tiny island (Britain).They may stop when the argument gets too hot, wimps!! Ummm, that would be melting permafrost, not ice. Permafrost is frozen ground which contains soil, sand, rocks, humus and plant material. As it thaws, the plant material is broken down by anaerobic bacteria and other micro-organisms which produce methane as a waste product. Also, as frozen lakes start to thaw, the plant material that was trapped in the bottom of those during warm intergalcial periods of the past goes through the same process. Do you really question that that process is taking place? Do you deny that permafrost is melting? Also, if you are suggesting that polar bears can survive in the same population densities as humans then i suggest you do a course in basic ecology…..very very basic ecology. My young daughter read your comment and was wondering if you finished elementary school? You have to love the basic upfront honesty of children. A melt layer every 150 years? Then it must be the Sun!But environmentalists are costing our economies and they ignore these type of facts. Perhaps oil may help industries to get us ultimately into space. To uknowispeaksense, do NOT confuse the denialistas with *facts*…those are just thing made up by us liberals to confuse the denialists.. I know Harry. I also feel like I’m talking to a 5 year old when dealing with these idiots. Lk.21:26 Men’s hearts failing them for fear, and for looking after those things which are coming on the earth: for the powers of heaven shall be shaken. Even if it doesn’t come completely true, it’s still scary. What’s scary is how easily people can be led into taking this pseudo-science seriously. Bomb toss Nu. 2,310. Keep waving those denier hands, Tom..it’s good for a laugh! It’s scary how people form ideas denying the reality of global warming, despite all the hard, factual evidence which is out there for them to get the truth if they weren’t too afraid to face it. 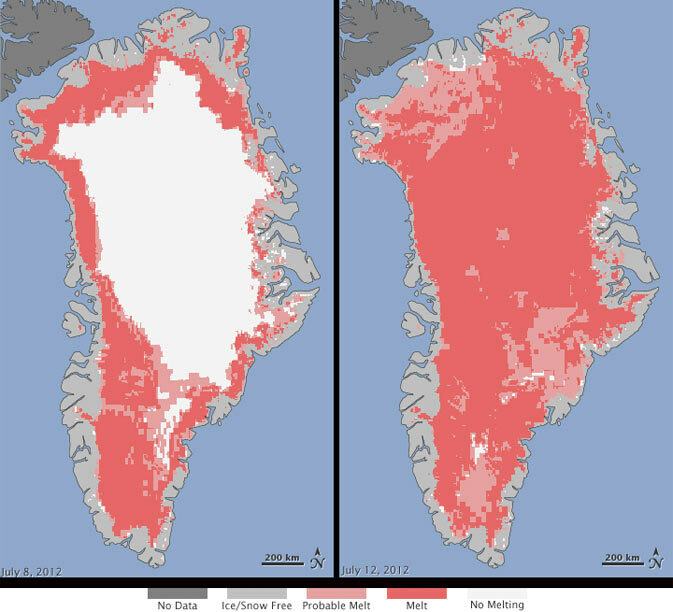 This melting in Greenland is a concern. Possibly more concerning has been the nature of the general debate over climate change, which has become politicised, reduced to polemic, and intellectualised in ways that highlight a lot of the down side of the human condition. To me it’s simple enough; Earth has always experienced natural climate change for a variety of reasons including variable insolation, cloud cover, continental drift and many, many other factors including episodic vulcanism. It is a chaotic system, meaning that it can flip from one meta-stable position to another relatively quickly in term of geological time, and on relatively small individual factors. In the last 200-250 years, humans have added a new factor to it, on top of all the others. Enough, it would seem, to start pushing the system into a different equilibrium. It’s a natural cyclic melt. They even admit as much in the press release. Panic over for today. The denialist are out in force, of course. To the rest of us, it’s just more of what everybody knows and politicians are paid to ignore. 1 – Ice is much more reflective at optical wavelengths than are rocks or soil or even vegetation. That is why the growth of ice-free patches decreases the optical reflectivity (albedo). 2 – CO2 is transparent at optical wavelengths, but it has huge absorption lines in its spectrum at infrared wavelengths, notably at 4.5 and 15 micrometers. Venus is an inferno, mostly because its atmosphere has so much carbon dioxide. That is a much bigger contributor than its being closer to the Sun. I find it so utterly frustrating that government mainly Republicans ignore reality and are still in the mindset that the earth is flat. This is serious, serious stuff and scary. We must act now but there is so much inaction. News stations like FOX and WSJ continually deny the blatant evidence that of global warming and the terrifying implications it means for the rest of the world in terms of flooding, draught, suffering, disease and dying. I recently met with Citizens of Global Climate Change in DC who are an excellent group of advocates urging Congress to do something. We need more people doing this kind of grassroots advocacy as it is going to be an uphill battle educating the public before it really is too late. Thanks for this timely post and drawing attention and urgency to global climate change. We need to do more and the time is now! It’s an interesting world we live in with so many closed loop systems, all interacting with each other. Interacting in ways we will never fully understand, but only make educated (and some uneducated) guesses at. My educated guess is that if one of these systems goes into an open loop situation and causes a bit of chaos around the place, then the effect on other systems will cause these other systems to react in such a way, as to bring the open loop system back to its normal closed loop condition. And then all will be well again. Of course, in the meantime, that bit of chaos may have been sufficient to eliminate some species of life on this planet of ours. No prize for guessing which life form would be a prime candidate…………………. Humanity won’t change its course: fossil fuels will run out, rare metals will run out, trees will die off, oceans will rise, earth will become largelya desert planet, technology will fail, transportation will fail, industrialization will fail. It’s too bad; because we could have been such find stewards of this planet. Though I’m generally an optimist, my science training, and knowledge of the human condition makes me tend to agree with this outlook. Interesting blog. I’ll be following. I notice you seem to attract some of the real loony deniers. They are an interesting lot to study in an exobiological sense.